Preferred Habitat: Fields and shorelines. Seasonal Occurrence: Abundant throughout the year. Nests in our area. Profile by Maria Hart: The Killdeer is a tall and slender member of the plover family. They can be easily distinguished by their long tails, slim wings, and their distinct dark double breast bands. While flying, look for their rusty colored rump and tail. Killdeer have named themselves with their shrill and animated “kill-dee” call, which is common sound to be heard over large areas of open land. They have even been nicknamed “Noisy” or “Chattering” plover due to their reputation for having a tremendous amount to say. This shorebird species is common and widespread throughout North America, as well as Central America and parts of South America and Europe. They can also be found during breeding season in parts of Canada. While many species of shorebirds have reaped the detriment of human infrastructure reducing habitat, the Killdeer have experienced benefit. Unlike other shorebirds, Killdeer spend a great deal of their time away from water, using a variety of man-made habitats such as farmland, animal pastures, gravel roads, parking lots, golf courses, etc. Occupying farmland has been especially useful to this species as they often can be found following a farmers plow, snatching up and feeding on insects that are upturned in the process. 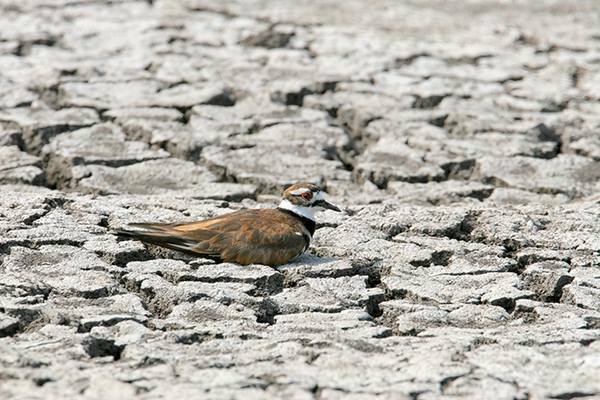 Killdeer generally feed on a variety of invertebrates including grasshoppers, earthworms, crayfish, centipedes, and snails. On occasion, they will consume seeds left in agricultural fields. Killdeer build their nests by excavating a small indentation in the bare ground, short grasses, or gravel. As egg laying begins, some Killdeer will line their nest with small items such as twigs, pebbles, grasses, and trash. Similar to other ground nesting species, the Killdeer uses a broken-wing display to attract predators away from nests or young by acting injured, appearing to be easy prey. 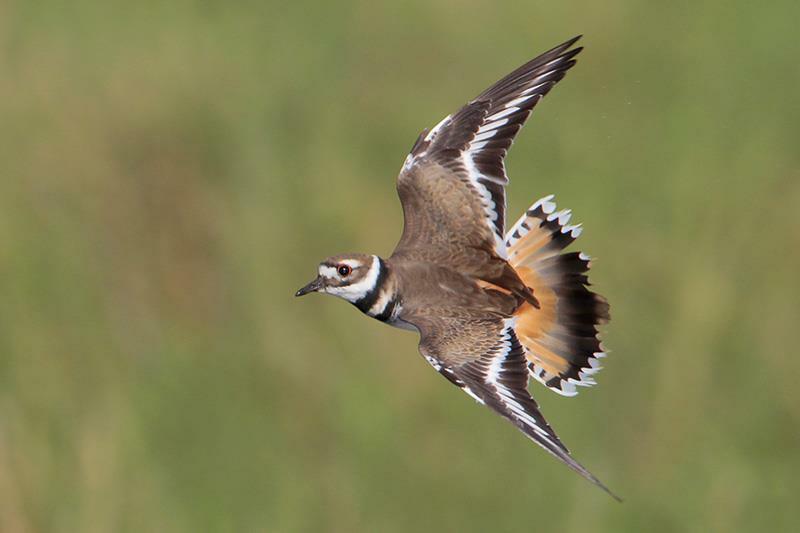 Killdeer are common in Texas throughout the year so if you want to see one yourself, look for them in any open field, or on any road or shoreline! Courtesy of Blake Slayton. Image taken in his backyard in Krugerville. Notes by Vicki Stittleburg: A shorebird you can see without going to the beach, the Killdeer is our most familiar plover. 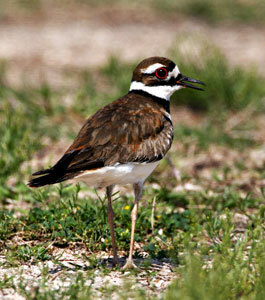 Slender and lanky with a long pointed tail and long wings, the Killdeer is brownish-tan on top and white below. The white chest is barred with two black bands and the brown face is marked with black and white patches. The bright rufous rump is conspicuous in flight. The Killdeer is ubiquitous; it's preference for open fields, gravel driveways, parking lots, beach edges, and golf courses has allowed it to thrive throughout our rural and suburban landscapes. The bird is named for its high, plaintive kill-deer call which is easily heard. Killdeer nest in a shallow depression on the ground in an open area with good visibility. 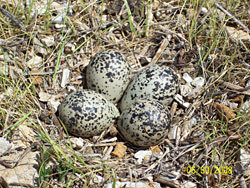 Typically 4 buff eggs blotched with black and brown are incubated by both parents. Killdeer are famous for their ability to feign a wing injury in order to lure predators away from their nest. Killdeer chicks hatch with a full coat of buffy down feathers and a single black breast band. They can walk out of the nest as soon as their feathers dry. 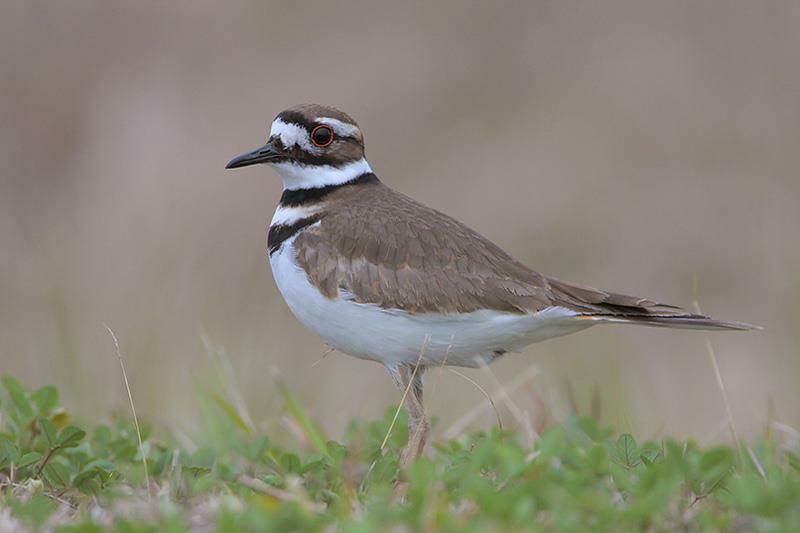 Killdeer can be found all across the state of Texas and are abundant throughout the year.